Get updated animation layer editor, SplineIK, and Cluster Deformation tools. Improved animation tools add SplineIK and Cluster Deformation to help you create more diverse and complex character animations. An updated Game Export tool makes it easier to manage and export multiple animation clips in one or more files. The animation layer editor is now available, supporting a 2-layer system for editing animation. 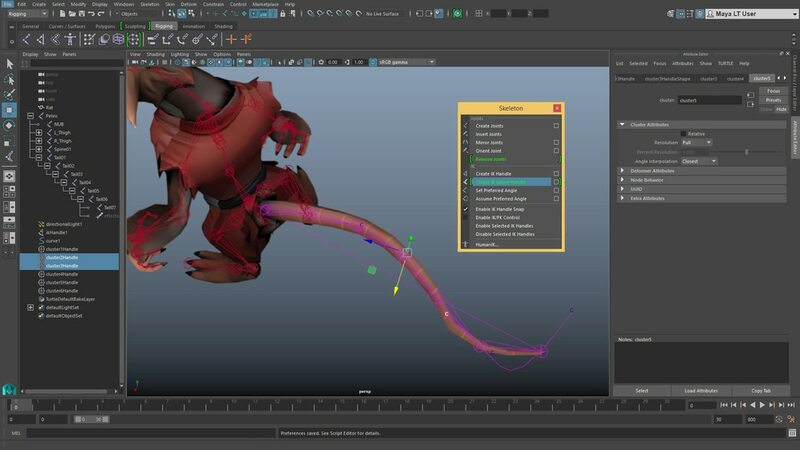 Character Controls and the HumanIK rigging system make it easier to create more complex animated characters and to reuse animations across different character models. Animators can now bake retargeted animation to the Control rig for further editing.